For most of us, the cute animals of the world fall strictly into the mammal or bird category. Bugs, insects, and other creepy crawlies are viewed with disgust, and most often end up squished on the bottom of our shoes. But this is a photo list which aims to change your perception of the little nasties, by showing you ten bugs that even the biggest insect-haters can agree are at least a little adorable. Sure—if you enlarged this guy to, say, elephant size, he’d be more than a little horrifying. But at his tiny scale, he has kind of a sweet, Yoda-esque vibe about him. Despite their delicate appearance, praying mantids are voracious hunters, disguising themselves as leaves before darting out at lightning fast speeds to ensnare moths, grasshoppers, crickets, flies, and other insects. Venomous spines are a little intimidating—we’ll concede that—but what’s cuter than a bug with his own saddle? Admittedly, attempts to find a rider have so far proved unsuccessful. These interesting critters live in the eastern half of the United States, and develop into an ordinary looking brown moth. A ladybug’s bright, cheerful color is actually used to warn off predators. Ladybugs secrete an awful tasting fluid in their legs, and their distinctive markings remind predators (who have sampled their kind before) that they taste disgusting. Even though snails are mollusks rather than bugs or insects, they tend to hang out in the same areas—and they’re far too cute to refrain from putting on this list. Interestingly, white-lipped snails act as their own cupid before mating, as they literally shoot their partner with a “love dart” before getting it on. Scientists believe that the dart helps to improve their chances of reproduction. With its suave good-looks and Elvis-like hairdo, have you ever felt a stronger urge to give a bug a high-five? Sadly, that’s not really his face—and being a stink bug, this fella is not so much a hipster as he is merely smelly. As with many bugs, his bold colors are designed to make predators think that he’s either venomous or bad tasting. Moths are generally considered to be ill-favored by the god of beauty, especially in contrast to butterflies—but here’s one moth that gives butterflies a run for their money. 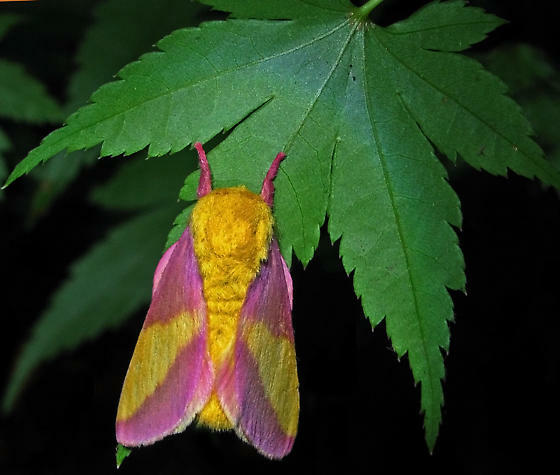 Rosy maple moths are found throughout North America, and are most often found around dusk, which is their favorite time to mate and lay eggs. Even as adults, grasshoppers aren’t too bad looking—but the baby ones are so adorable that you may even be willing to let them ravage your crops. Except for the freezing North and South Poles, grasshoppers can be found nearly everywhere on Earth. Although the bug in the photo above looks a little bit like a friendly Martian, he’s actually just one of many types of treehoppers found throughout the world. Sadly, individual treehoppers live only for a few months. As a species, however, they have existed for forty million years. These lovable, anime-eyed caterpillars technically don’t have big eyes at all—just conveniently-placed spots that resemble eyes. But if you add these spots to their bright green color, they end up doing a pretty good job of mimicking green snakes—which turns out to be the whole point of their unusual appearance.